The school year is quickly coming to a close...yay! The boys have been busy with their studies and I've been thinking about making end of the year goodies for their teachers. Note the word "thinking"! Last night, Jess told me that today will be the last day for his extend classes. So, I had to quickly stop "thinking" about it and get it done! Do you love it? I do. And Jess really liked it. I'm sure Mrs. S. will too. 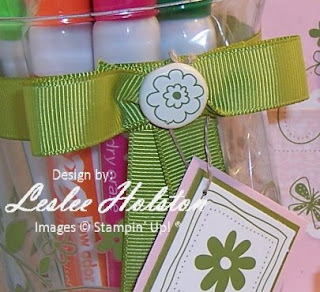 I love the idea of giving usable gifts. Teachers get so many knick knacky sort of things and, while it's not that they don't love it or appreciate it, they just run out of room to display all these gifts. The boys and I decided to give dry erase markers (an item that teachers themselves would generally purchase for use and is used all throughout the year). We picked out these cute glass jars (under a buck at the local Wal-Mart). It can be used as a vase or candle holder (I found it in the candle section). 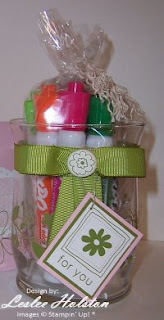 I decorated the jar using the retired Love & Happiness rub-ons. Wrapped a length of Old Olive grosgrain ribbon around the neck and created a cheater kind of bow. It's actually a loop of ribbon with the big 5/8" Very Vanilla brad pinching the center together. The 'tails' are simply adhered with a pop up glue dot. Yes...I really cheated on this one! And check out the rub-on flower on the brad. Pretty cool, huh? Of course, the tag uses the same rub-ons too! So does the card. As a matter of fact, there is no stamping on this card at all! A very simple card. Pink Pirouette base, a strip of eyelet border punched Whisper White with a strip of Bella Rose DSP. 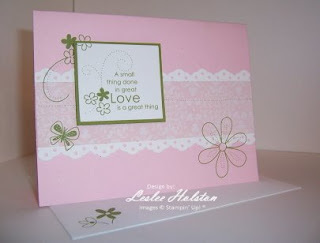 The sentiment was rubbed onto a square of Whisper White and layered onto Old Olive (same color as the rub-ons). I used additional rub-on images and placed them so that they would run off the layers. A really neat effect. Don't forget a rub-on on the envelope too! It's the extra added touch! You can see how I did the little box of chocolates in this post. Again, by wrapping the individual chocolates, you give it an added special touch! It doesn't take long, or much, to make someone feel truly special! 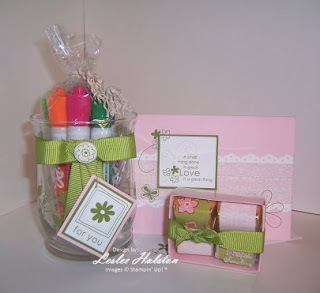 I can't wait to hear how Mrs. S. liked her gift set! I can't wait to hear what you think of it! Your comments are always welcome. Thanks for stopping by today! I hope you've been inspired to use some of those rub-ons you've been hoarding. I'm guilty too! Have a great day!